Being occupied madly in worldly matters, we never think of our spiritual uplifting. All we long for is, the enjoyment and worldly pleasures. Shaken off by my soul, I set out my tour for Bodh Gaya in Bihar. My Bodh Gaya tour was sudden but with a push by soul in the search of tranquillity. Wishing to re-establishing my union with God, I headed on to Bodh Gaya trip. I took along my younger sister Elena with me and we started off from Delhi by train. It took us almost the whole day to reach Bihar. The state boasts of a rich history of its remarkable culture, ancient tradition sand religious beliefs. Bihar was also ruled by some of the great dynasties in India like Magadh, Ashoka and Chandragupta Maurya. Bodh Gaya is among the most sacred Buddhist pilgrimage centres in India that have added fame to the state. On being reached Bihar, we were finally feeling being closer to the tranquillity that we had almost lost in our busy life. Sometimes I wonder how can we forget the almighty with whose blessings we have been able to enjoy all the materialistic pleasures. Bodh Gaya is the place where Gautam Buddha, the spiritual leader of the Buddhism is known to have attained divine knowledge while meditating under an abstruse Banyan tree. I hastily went on to explore some of the iconic sites in Bodh Gaya. 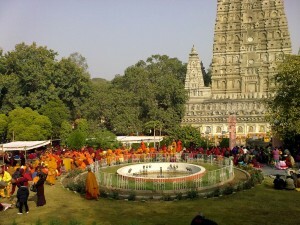 First one was the famous Mahabodhi Temple in Bodh Gaya. This architectural wonder also serves as a blessed pilgrimage site. 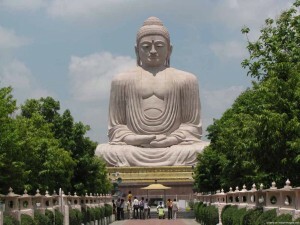 This famous tourist attraction in Bodh Gaya is also listed in World Heritage Sites. Expelling the divine energy flow, the site also took me along to a celestial world. Sharing his knowledge, our guide told us that it was built by the Buddhist emperor, Ashoka. The Mahabodhi temple also houses a diamond throne shrine. It is home to a leviathan black statue of Lord Buddha, sitting cross-legged. I was too excited to see the Bodhi Tree. That was the place where Lord Buddha is believed to have meditated and attained supreme knowledge. He attained enlightenment after seven days. Another platform, called “Chankramanar” adorned with 19 lotuses is also established to commemorate his walking meditation. I felt blessed and the existence of some divine energy was so powerful that I could not resist it for a moment. The time constraint did not allow me to explore other places in Bihar. The innate peace that I felt during my Bodh Gaya travel filled my mind with celestial joy.